“So I guess things were a little too busy for you to do that webinar I emailed you about?” I sheepishly asked Shafiq Rab, VP/CIO of Hackensack University Medical Center, as we stood in the back of the conference room during a keynote presentation at the CHIME spring forum. “What webinar?” he asked, looking at the speaker on stage. “The Vendor X one. They wanted you to talk and they were going to sponsor it,” I said. “Sure. Too bad we couldn’t put it together,” I said. “Put it back together. I’ll do it,” he said, still looking at the stage. As I started to explain different ways the event could be structured, he cut me off. “Sure. You’re my friend. Whatever you need,” he said. 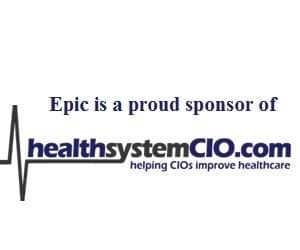 And I have been lucky enough to move at that speed with other folks in the industry, such as Chuck Christian, VP of Technology & Engagement with the Indiana Health Information Exchange, who was the first person I recruited to be on our new “Ask the healthsystemCIO.com All Stars” webinar series. Starting in September, we’ll produce a monthly webinar roundtable discussion and debate series inspired by one of my favorite TV segments of all time — the Meet the Press roundtable as it was hosted by Tim Russert. So I had the vision, and it was time to recruit some panelists. With my excitement, I was in a hurry and so wanted to move at the speed of trust. As usual, I started with Chuck — a human version of the classic “anchor” store: that store every mall needs to attract other tenants (think Macys). Chuck loved the idea and signed on, followed by Dr. Rab and others as the roundtable rounded out. And so we have the first six monthly events slated. But the rapidity and enthusiasm with which my “anchors” signed on made me realize just how important these folks are to our publication and how important it is to have folks like these in our wider lives. Anchors are those people to whom you need offer no explanation and little pleading. They only have to hear you begin a sentence and suspect it will end in a question mark to offer a, “Sure.” They only need to know that you are in need to offer assistance. They are the rocks upon which you can build so much and without which it’s time to look inward and figure out why they are absent. And after that, you might want to consider becoming an anchor yourself (of course, you probably already are one) — this means simply being a friend, a support, a mentor; it means you’ve given someone your stamp of approval, your imprimatur of trust. It’s someone to whom you offer unconditional support because you know they think just as much of your well-being and reputation as their own. If you can name both a handful of anchors who support you and a few to whom you serve as one, it will take an awful lot to sink you. I think you really nailed the main theme that you have a good core of professionals who are willing to give their time and talent to our industry and help all of do the right thing for our patients and communities.